Description: Want to Post / Upload Animated GIF Images on Facebook? A Simple Guide to Post GIF Images on Facebook Status, Pages or Comments. Do you want to share or upload animated gif images to your Facebook status like others do? If yes, here in this article we will show you how to post an animated gif on Facebook. Animated GIF images are basically combined with images or a short video clips that play in a loop which can express something better than the normal images or text messages. You can also say to GIF image as the silent video clip that play in loop continuously. As we all know, an image can express thousands of words instantly so the animated GIF can express more than that. You might be also seen the use of animated GIF images on other websites and it becomes popular these days. Many social media sites like Google+ and Twitter also using it directly via their upload media function but Facebook still doesn't allow to upload animated GIF images through the media upload function. 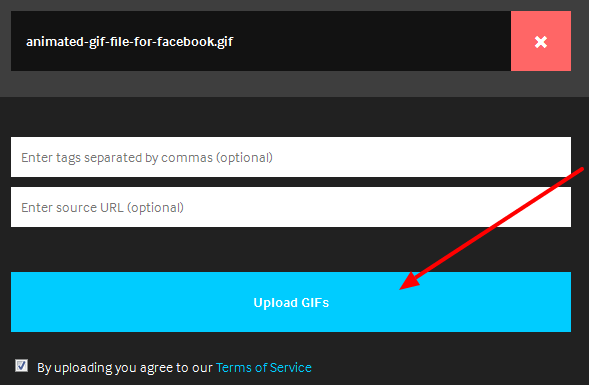 However, You will have now choices to upload your animated GIF images to your Facebook account. 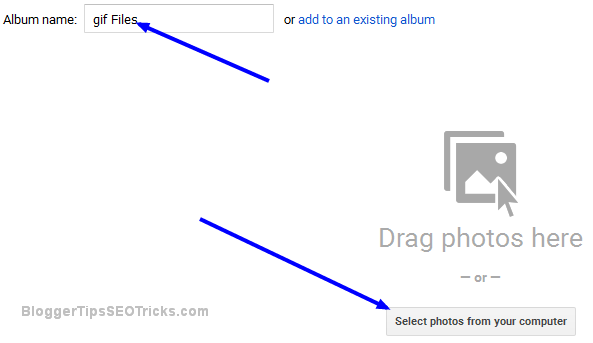 Therefore, here is a simple way to post or upload animated GIF images on Facebook. First, you need to find a GIF image that you want to share on Facebook. Either you can select any GIF image stored in your local storage or you can use any GIF file that you see on another websites. However, there are many websites where you can find and search GIF files to share on Facebook. GIPHY is one of them. 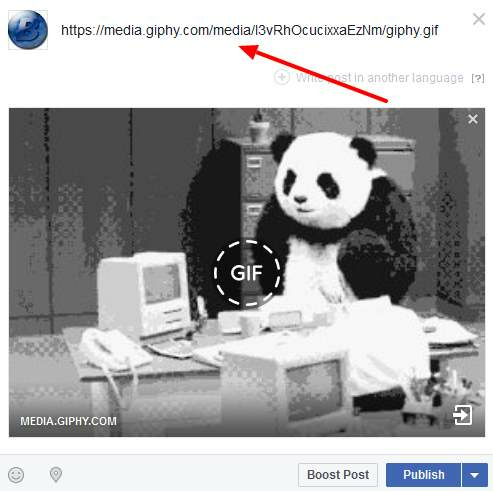 Just find the GIF using search like funny, amazing or reactions and copy the direct link of that animated GIF image and use it on Facebook (read following to copy link and sharing on Facebook). 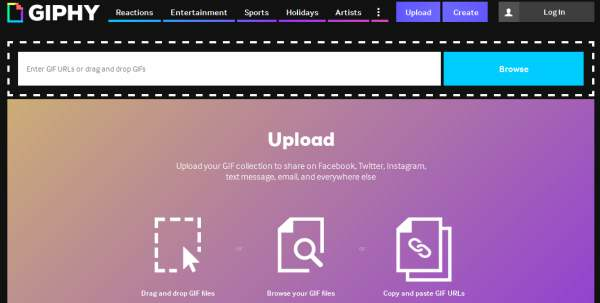 Let you have an animated GIF file stored in your local storage, then you have to upload it on any image hosting websites like GIPHY. Here is how to do that. Go to GIPHY, and click on Browse and select your GIF image from your local storage. Now, click on Upload GIFs. It will take few moments to upload your GIF to their server. Once it is ready, right click on your animated image and click on "." Now go to your Facebook news feed or Facebook page where you want to share animated image, and paste this URL in the status box. Once your GIF image appear, you may delete the URL from your status box, and write the suitable text. Finally click on "Publish". That's it! Your animated GIF image has now shared on Facebook. If you don't use Blogger for hosting and still you want Google server to upload your animated GIF images then you need a Gmail account, you're just few minutes away. If you don't have Gmail account, you can create a free Gmail account. I am using Gmail account because majority of peoples have already Gmail accounts. Now, get started. Go to Picasa Web Album. Each Gmail users have 15 GB free space on their web album. You can use this space for hosting your photos including animated gif. Write your album name, and drag and drop your gif file from your hard disk here. You will be redirected to the recently created album. Now, click on your photo. It will display the actual animated picture. Right click on the animated image, and copy the image path direct link. 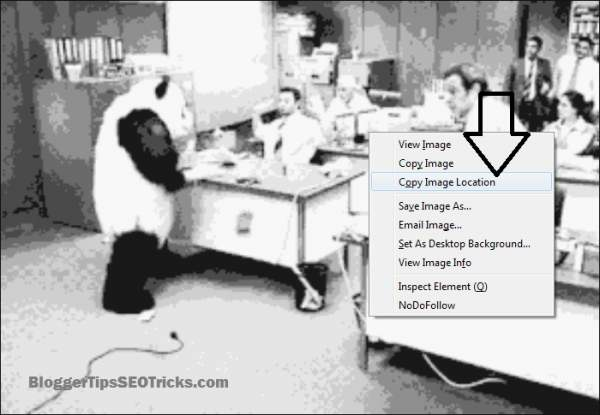 For firefox users it is 'Copy Image Location', for chrome 'Copy Image URL'. Make sure your direct link ending with .gif extension. Once you find the direct link, you're on the go as mentioned earlier.